Description: Handmade by Journeyman Smith Jim Arbuckle, this fine point slicer is a perfect choice for slicing in the kitchen. Fine cuts of fruits and vegetables are a breeze. The slender shape also makes this a great choice when removing silver skin from meat. The 4-3/4 inch blade is formed from high performing ATS-34 stainless steel. It is hardened and double tempered to 58-59 Hrc. 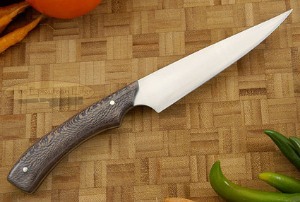 A hand rubbed satin finish lends an heirloom quality. 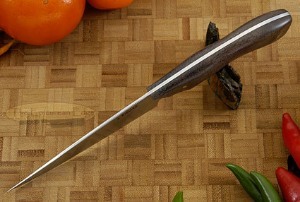 The blade is convex ground to minimize food sticking to the blade. This technique is much more effective than a granton edge! 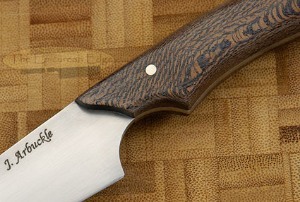 The contoured grips are formed from presentation grade snakeskin sycamore. By stabilizing the wood, Jim ensures that they will hold up well to the demanding environment of either a home or commercial kitchen. A deep choil provides a comfortable, secure place to rest the 1st finger. 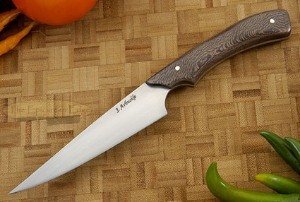 The handle allows for several different grips and makes the knife easy to maneuver even with slippery hands. Excellent fit and finish throughout! 0.578125 0.265625 578.125 265.625 Trailer Started. 1.265625 0.6875 1265.625 687.5 Trailer Completed.